Lindsay is the LEEEP Education and Sustainability Coordinator at Marion Cross Elementary School in Norwich.LEEEP stands for, “Learning about the Environment through Experiential Education Projects”. 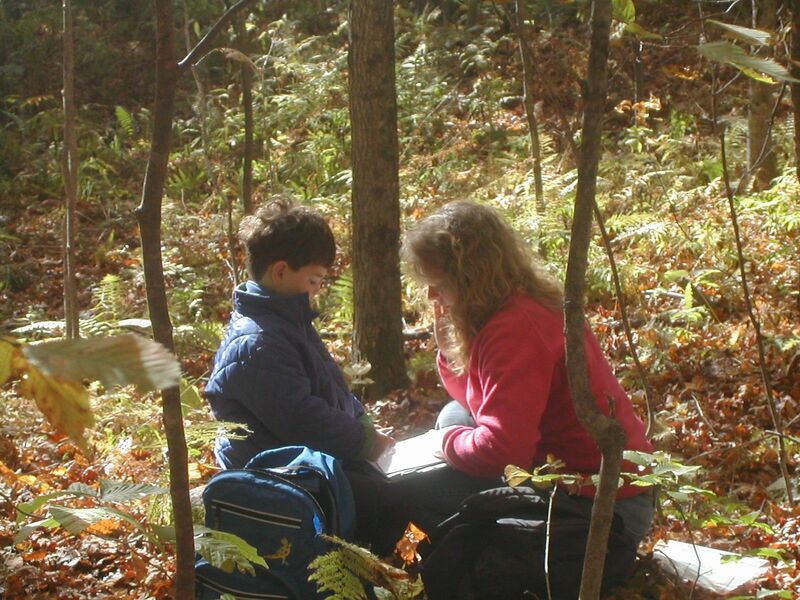 In addition to habitat studies with each classroom, Lindsay organizes hands-on, place-based learning throughout the curriculum at all grade levels. “The best thing about LEEEP is seeing the joy that outdoor learning and outdoor work brings to children,” Lindsay says. The main focus of LEEEP is on inquiry-based science using local habitats—forest, field, river, stream. Lindsay also partners with teachers to help them with classroom investigations that relate to habitat studies, orienteering, nature photography, and community service projects. Marion Cross School has a very long history of teachers embracing outdoor learning. The LEEEP program was originally created as a way to support all teachers equally in implementing that mode of learning, including those who were less comfortable doing it on their own. It has evolved since 1998 but maintains that foundation of strong collaboration. LEEEP has grown to include the school projects and special events that everyone participates in, such as the school garden, sugaring, Fall Clean-up Day, Earth Day, and three seasonal harvest “meals”. Lindsay organizes special science-related school programs such as visits by Mary Holland, and The Caterpillar Lab. She works with students and teachers to promote and maintain the school composting system. They use the resulting soil in the school gardens. Lindsay continues, “There is always an element of collaboration between the classroom teachers and myself. At this point in my leadership of the program, we usually have a very fun and engaging first outdoor experience and we happily move forward from there!” She says this was not always the case, however, so, people who are new to outdoor-based education should not give up after a few glitches. A big benefit of the LEEEP program is that it enables classroom teachers to do more PBEE than they otherwise might. That was the original goal, and they have succeeded. “It takes a lot of time, prep, organization, and clean-up to do some of our projects. It would be challenging for many teachers to have the time on their own,” says Lindsay. LEEEP also offers school-wide consistency. This is an advantage of having an in-house environmental educator. Lindsay sees all grades from kindergarten upwards. Students become accustomed to outdoor field work, they learn to approach LEEEP classes with a scientist’s mindset (rather than thinking it is an enhanced recess). The processes and expectations are fundamentally consistent throughout their 7 years even as they learn new skills each year. The consistency enables them to learn new skills more readily. LEEEP has helped to establish a school culture of environmental appreciation and understanding, as well as certain scientific skill sets they might not learn in a classroom. Parents volunteer for a lot of things and have always been a very strong part of the Marion Cross school community. LEEEP has enhanced that. “People see us trekking along the road to the brook and appreciate that we are learning about our local environment. Community members have come into the school to give special presentations and classes. And the students have given presentations to the Conservation Commission. Community members see the hand-painted trail markers that children have made along the trails and express their appreciation,” says Lindsay. Subsequently, LEEEP has a lot of support. Marion Cross School teachers are very supportive of the concept and value it as part of the curriculum and the school culture. And the school is fortunate to have financial support for special projects from the PTO and various community organizations and funds. The Frye Fund for Experiential Education, the Norwich Conservation Commission, the Norwich Women’s Club, Norwich Lions Club, the Byrne Foundation, the New Hampshire Charitable Foundation’s Wellborn Fund, parents, and anonymous donors have all made LEEEP possible. With the support of the administration and after 20 years of grants and special allocations, the program coordinator’s stipend is now included in the school budget. “Thank goodness for LEEEP. And thank goodness for Lindsay,” says Bill. The success of the Marion Cross program has spawned other outdoor programs at the school. Forest Fridays for the kindergarten had substantial support in part because of the impact of LEEEP. Wandering Wondering Wednesdays in first grade are a natural extension of the school’s science focus and LEEEP.